Shutters look beautiful in various interior window treatment applications. Prior to deciding on what shutter will look best, read some frequently asked questions people have about California and Plantation shutters. 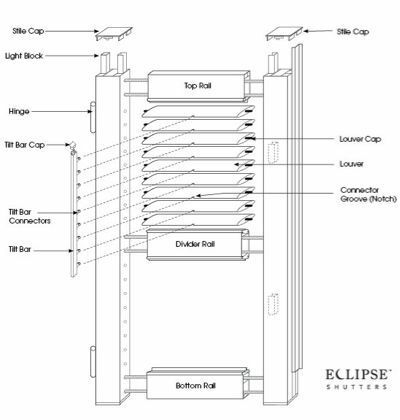 Why are Eclipse™ Shutters so popular? The Tilt-Bar can be in the front, middle of the shutter, or hidden in the rear if using the Clearview® system. Either way, it controls how open the shutters are. The Top and Bottom Rails outline the shutters and contain the louvers between them. The Divider Rail runs through the center of some shutters, depending on size. When there's a divider rail, the top and bottom louvers operate independently of each other allowing for the top to be open and the bottom closed, for example. The Frame surrounds the shutter and finishes off the decorative look of the window. What colours do Eclipse Shutters come in? Eclipse Shutters are available in a range of neutral shades that can fit in any type of decor. Cotton: Our most popular colour and our brightest white. Pearl: Our version of off-white. Vanilla: Our version of cream. Louvers for Eclipse Shutters are available in 2 1/2 inches, 3 1/2 inches and 4 1/2 inches. The wider the louver, the wider the space between louvers will be when they're fully open. Louvers measuring 3 1/2 inches provide 56% greater visibility than their smaller 2 1/2 inch counterpart. Similarly, the 4 1/2 inch louvers provide a view that's 108% more clear than the 2 1/2 inch louvers. How do I move shutter blades? Eclipse Shutters have three options for moving the louvers. 1. Traditional shutters use a tilt-bar. It can be placed in the centre front of each panel, or offset to the front side of the panel or offet at the rear of the panel. The tilt bar connects the louvers and is use to operate the louvers. 2. Our Clearview tilt system uses a sleek tilt mechanism connecting them at the end of each louver on the rear side of the panel. 3. The UltraGear tilt system is located inside the panel. The look is sleeker since there are no visible tlt bars in either side of the panel. Both Clearview and UltraGear systems are operated manually. Both are easy to open and close, and provide unobstructed views. How are Eclipse Shutters cleaned? Unlike other wood products, it's incredibly easy to clean and care for your Eclipse Shutters. When needed, simply wet a soft cloth with water and wipe the shutter panels with the damp rag. They can also be cleaned with a mild soap, though not with lemon oil or furniture polish. Since Eclipse Shutters are non-porous, they will never mildew or mold. Eclipse Shutters Canada authorized dealers have our environmentally safe cleaner specifically engineered to clean vinyl shutters. Please contact us for more information. 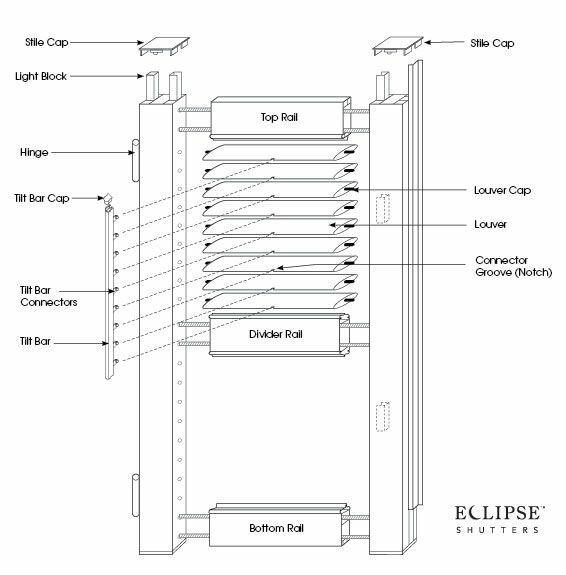 How are Eclipse Shutters installed? What type of warranty does Eclipse Shutters offer? Eclipse Shutters are designed to last a lifetime when properly cared for and are guaranteed for 25 years. Please refer to the Warranty for specific details. Do Eclipse Shutters increase the value of a home? Eclipse Shutters help in two ways. They increase the curb-appeal on any home and will likely increase the number of people who will consider purchasing. It's also been estimated that they will increase your homes appraisal value by several percentage points. How do I contact a dealer to buy Eclipse Shutters? Click on "Where to Buy" on the Eclipse home page. Type your city into the " City" field; click enter. A list of authorized Eclipse Shutters retailers will appear. These dealers have been trained by Eclipse Shutters. The shutters will not yellow or discolour. However, residue from a non-recommended cleaner could cause the vinyl to yellow over time. Shutters are designed to provide light-control and will be somewhat room darkening. They are NOT a black-out window covering. There will always be varying degrees of closure within a shutter panel, which means there will be light-lines of up to 1/16”. By keeping the louvers slightly open, there is a visual perception of “even” light lines.